The Language macro is designed to make it easier to conform language spelling to the desired form, such as changing British spellings to American spellings. The Language macro is similar to the Journals macro and is governed by a Manager, shown here. The Language macro supports any language style change — including words that have accents, as long as the letters can be found in Word's Character/Symbol set. It is fully customizable and you create the individual dataset, so you can create a list of words to change from British to American, American to Canadian, French (France) to French (Canadian), and even variations based on dictionary differences, such as between Merriam Webster and American Heritage. Adding words to the Language Conversion dataset is easy. It is done via the Language Conversion Manager. There are two options for adding a word: First, to add the word alone and second, to add a word that should be changed to a correct spelling. 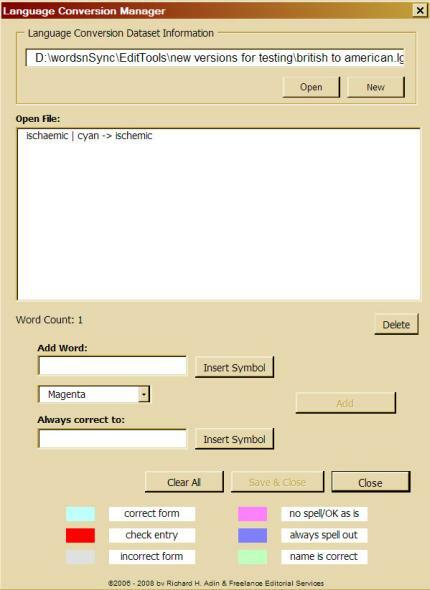 To add a word alone, simply enter the word in the Add Word field as shown below and click Add. This will add the word to the dataset. This option is likely to be rarely used. To add an word that should be changed, enter word in the Add Word field and the correct form in the Always correct to field, as shown below. Click Add to add the information to the dataset.